A critical component in sustainability is the ability to collect accurate and meaningful data through electronic medical records (EMRs) – the subject of two abstracts from the I-TECH Kenya team. In addition, online learning and electronic learning (e-learning) provides opportunities for health care workers in resource-limited settings to gain critical knowledge and skills while minimizing their need to leave the workplace. In close partnership with the University of Washington Department of Global Health’s eLearning Initiative (eDGH), I-TECH piloted e-learning modules for KenyaEMR and transitioned the HIV management diploma program at the University of the West Indies into a blended learning program that incorporates online courses. The transcript tab allows learners to read along with the narration. Since 2012, the Kenyan Ministry of Health, PEPFAR, and partners have supported implementation of electronic medical record systems (EMRs) at more than 600 public-sector health facilities. The International Training and Education Center for Health (I-TECH) has supported scale-up at more than 300 of these sites. However, implementation is just part of the story. Successful, sustained use of EMR data depends upon the knowledge and skills of front-line health care workers. To address this need, I-TECH and eDGH developed and piloted two interactive e-learning modules on EMR data quality and EMR data for decision-making. 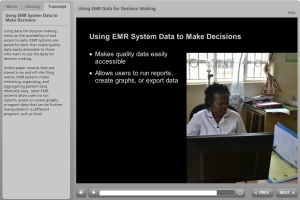 I-TECH and eDGH found that facility staff were motivated to use EMR e-learning modules and apply what they had learned. Participants found the content relevant to their jobs and cited an interest in additional scenarios and modules. Self-paced e-learning modules were determined to be a viable solution for standardizing sustainable training on EMR systems. To support progressive EMR data quality improvement, I-TECH developed a Routine Data Quality Assessment (RDQA) standard operating procedure and analysis tool. The RDQA procedure was defined in collaboration with the Kenyan Ministry of Health and integrated within existing policies and procedures. From 2014 to 2015, 180 baseline and repeat assessments were conducted. I-TECH supported facility personnel to share results during county-level EMR review meetings; these presentations motivated other sites to plan for RDQAs and fostered a culture of ongoing data quality improvement. The RDQA procedure for EMR data has now been institutionalized as a method for progressively improving EMR data quality in Kenya. In partnership with the University of the West Indies (UWI), eDGH and I-TECH transitioned a one-year diploma program in the Management of HIV Infection to a blended learning platform that combines online courses with either a clinical practicum or a research project. The shift in pedagogy, methodologies, and technologies was achieved through a three-phased approach designed to not only train UWI faculty and staff, but also transfer online facilitation skills to them and sustain those skills. In its second year as a blended learning online program, the diploma program has scaled up to include health care workers from Cayman Islands, Jamaica, and Suriname. These projects are supported by the Health Resources and Services Administration (HRSA) of the U.S. Department of Health and Human Services (HHS) under U91HA0680, International AIDS Education and Training Center. The content and conclusions of this post are those of the authors and should not be construed as the official position or policy of, nor should any endorsements be inferred by, HRSA, HHS, or the U.S. government.